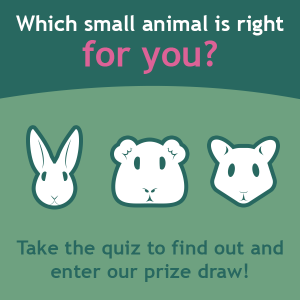 Which small animal is right for me? Cats and dogs make great pets, but they’re definitely not for everyone. Some people prefer smaller furries like rabbits, guinea pigs and hamsters, which are popular pets for good reason. But which is the right small animal for you? If you want to find out, have a read of our insights and take our fun quiz! We have chosen the 'top 3 most popular small pets' but there are plenty more! Naturally curious and social animals, rabbits are the third most popular pet in the UK and are owned by roughly 1 million families, many of which keep them as ‘house rabbits.’ This is because they are easily litter trained, making them versatile pets that can go indoors or out providing their care needs are met. This includes ensuring the right bedding, diet and enrichment is provided, as well as your time and attention daily. Despite being social creatures that thrive on company and interaction, few rabbits enjoy being handled, which makes them a better choice for older children who won’t manhandle them or make sudden movements to frighten them. Rabbits are also fairly big animals that can kick out, scratch and bite when they move or feel threatened. Typically, rabbits are friendly and gentle creatures (when handled with care) and have the intelligence and sense of adventure to make them thoroughly enjoyable pets. If you want a companion that likes the occasional cuddle and stroke, but generally prefers the company of its fellow bunnies, maybe rabbits are the right small animals for you! Guinea pigs are another popular small animal, present in half a million UK households. They are often described as great starter pets that are ‘easy to care for’ and require less space than rabbits. That said, their care needs should be considered first and foremost if you are to have a happy, healthy pet! Like rabbits, guinea pigs are social creatures that enjoy the company of their own kind. This means they are happiest in a pair or herd, although they also seem to enjoy the company of humans too! When it comes to handling them, most guinea pigs need time to adjust to the idea before they are confident with it. Once they are, most guinea pigs will sit comfortably in a lap for a short period of time and will enjoy being groomed. If you are looking for a pet that is happy to exercise itself and explore with its friends, as well as a pet that enjoys human companionship and cuddles, maybe a guinea pig is right for you. But don’t forget – most piggies need other piggies around them, so don’t acquire just the one. Small and quick, hamsters are perhaps unsuitable pets for young children who may have difficulty handling them safely, without them escaping their cage. Unlike rabbits and guinea pigs that have similar sleep patterns to ours; hamsters are nocturnal creatures that are most active at night. This means that caring for a hamster is best done in the evening when they are awake and alert. Because of their compact size, hamsters can easily feel threatened and nip you, especially if they are manhandled or taken by surprise. However, the more a hamster is handled in the correct manner, the more tame it becomes and the less likely it is to bite you. If you would be worried about handling a hamster bearing in mind how small and fragile they are, then this is probably not the pet for you. Unlike rabbits and guinea pigs that need companionship, hamsters can take it or leave it. Dwarf hamsters are generally sociable and can get along well with each other, although female hamsters can fight so might be better off alone. Syrian hamsters are naturally solitary creatures and their territorial nature means they should live alone. I just did your quiz. I was glad to find out that I am a Guinea Pig person as I run a Guinea Pig Sanctuary.